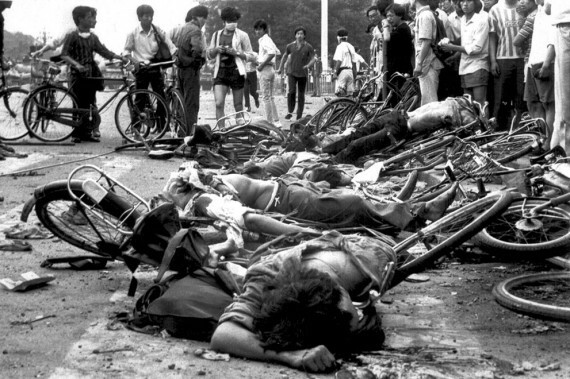 The commemoration in the U.S., earlier this month, of the 25th anniversary of the Tiananmen Massacre was strangely subdued, especially within the Chinese student community in this country. It was very different in the period following the actual events of ‘89. I was in the States on a lecture tour with my friend Lhasang Tsering la, and we met and talked to many Chinese students. There were about 40,000 of them in the country at the time. After the military crackdown in Beijing, Congress passed legislation giving them asylum and permanent residency. Most of them had really little or nothing to do with the protests in Tiananmen, but the cachet of being a Chinese pro-democracy activist was high in Europe and America then. The students we met all expressed near missionary zeal in their advocacy of democracy (or their understanding of it) and were no doubt sincere about it then. The way I remember it though, on the issue of Tibet, they could be very annoying, even obnoxious at times. At our talk at Cornell University in Ithaca, Lhasang la and I were preceded by Rinchen Dharlo la who had just been appointed the Dalai Lama’s representative in New York. The Chinese students in the audience spoke to him in the most condescending way and scolded him about raising the issue of Tibet. They declared that the issue of Chinese democracy took top priority. Once they had thrown out the Communist Party and made China a democracy, then freedom for Tibetans could be discussed. I pointed out that the opposite was equally possible and the regime could become even more repressive and murderous. One snip of a fellow piped up “We the Chinese people will never allow that.” I laughed and shouted back “When have the Chinese people ever had a say in their own politics.” Lhasang la also jumped right in and didn’t mince his words. Most of the actual Tiananmen activists we met in later months, Chai Ling, Shen Tong, Wu’er Kaixi, etc., were ambivalent on the issue of Tibet. But the exile government saw an opportunity for “outreach” with China and Chinese dissidents. A great deal of energy and money was spent, especially from His Holiness’s private fund in “cultivating” these people and it essentially got us nowhere. ICT staff devoted a lot of time to shepherding Chinese dissidents around Washington D.C. and introducing them to members of Congress and the administration. But not one of these dissidents ever came out openly to declare his or her support for the Tibetan cause. The few guarded circumspect statements they made about human rights for Tibetans were something they had to do anyway. No one would take them seriously if they didn’t. And where are these so called dissidents and pro-democracy activists now? According to Ian Buruma in his 2003 book, Bad Elements, Chinese Rebels from Los Angeles to Beijing, they have either become go-getting business types and flashy media consultants, or are fighting among themselves, often viciously. This is not to say that the Tibetan issue does not have real Chinese friends. Wei Jingsheng, one of the earliest and most steadfast champions of Chinese democracy, has spoke out openly and regularly for the cause of Tibetan independence. The journalist Cao Changqing has written two separate pamphlets discussing Tibet’s right to independence and the need for Tibet to be independent for the survival of the Tibetan people. Veteran Laogai research scholar and human rights activist Harry Wu spoke out in Dharamshala last March, making a strong case in support of Tibetan independence. In an act of censorship of sorts, his remarks were not reported on CTA’s websites and the video of his speech was not made public. I myself have personally met a number of Chinese activists especially in 2008, who supported Tibetan independence. More recently a Chinese dissident operating under the nom de plume of Kalsang Dhondup, has, on his own steam, been diligently translating every one of my writings (and doing an bang-up job, I am told) and circulating it in the Chinese language digital world. I have not paid him a cent or introduced him to Nancy Pelosi. Check out his website. But these days the exile administration does not want Chinese friends who call for Tibetan independence or the overthrow of the Communist regime. They want Chinese friends who will come out in support of the Dalai Lama’s signature China policy, the Middle Way Approach (MWA). His Holiness himself has expressed great confidence in the success of his “Approach”. In a 2010 Hindustan Times interview he declared “One Day I Will Win Over the Chinese”. In order to realize this vision an “outreach” program has been developed and has been ongoing for some years. In July 2010 His Holiness went on Twitter, to post messages to the Chinese people and to take questions from them. But even before this “Twitter” episode His Holiness had used his interviews and press conferences with press international media to reach out to those he now regularly refers to as his “Chinese brothers and sisters”. You know, till 1959 the Tibetan attitude toward the Han Chinese was affectionate, very close, something normal. Chinese traders in Lhasa used to be referred to with affectionate respect. But, of course, the name of Communism is feared in Tibet because of what happened in Mongolia, and to part of the Buddhist community in the Soviet Union. Then the Chinese Communists entrenched themselves; more soldiers came and their attitude became more aggressive, more harsh. Even at that time we complained about these ‘bad Communists,’ but we never said ‘bad Chinese.’ Never. His Holiness is not limiting himself to giving press statements but making every effort to personally meet Chinese people on his travels, even tourists and visitors in Dharamshala. Among these are Chinese “intellectuals” (khaypa) that he often mentions in his public talks as supporting his Middle Way Approach. To name a few: Li Jianglin, Ding Yifu and Chen Pokong who claims “he has met the Dalai Lama on many occasions”. These people give a surface impression of being sympathetic to Tibetans, and in fact write on Tibet and claim to be experts on the Tibetan issue, but are invariably vague on harder political issues. None of them appear to be in Beijing’s bad books or have records of even being detained by the PSB. One source in the CTA told me that these days His Holiness meets more Chinese visitors than any other outside group. This has troubled many Tibetans, particularly some retired officials, one of whom spoke to me about this. It would certainly be reasonable enough for us to assume that among the many, many Chinese who are readily ushered in to meet His Holiness (a privilege that a lot of us Tibetans do not have) there are definitely some agents of the Chinese intelligence service. I am sure readers have come across media accounts of China’s enormous spy program to infiltrate American high-tech firms, universities, research institutes, possibly even the military and the bureaucracy in order to steal secrets and influence policy. The Chinese intelligence agencies have used visiting scholars, university students, tourists and other innocuous visitors for this purpose. Much the same sort of people meeting the Dalai Lama. There have been a number of well-attested security breaches in Dharamshala. In one instance when such a breach was uncovered and officialdom questioned, the then prime-minister Katri Professor Samdong Rinpoche, declared serenely that it did not matter as Tibetans had nothing to hide. Chinese intelligence operations abroad are directed principally through the Ministry of State Security (MSS). But in our case we should not overlook the United Front Works Department, the agency that handles the Dalai Lama’s negotiators. Dharamshala is blissfully unaware of this but the mandate of this agency, revealed in a 2010 Canadian publication, includes the recruiting of agents among the Chinese diaspora (and among sympathetic foreigners), the control of Chinese students abroad, propaganda and long-term clandestine operations. Most Tibetans in Dharamshala are woefully unsophisticated and naive when it comes to such matters. Dharamshala spy paranoia is invariably directed at “new arrivals” from Tibet. Generally it amounts to very little, but last year we had the case of an alleged spy Penpa Tsering, who was arrested by the Indian police for planning a “terrorist poison plot.” He turned out to be a low level agent of the Gonganju (PSB), and his terrorist plot was probably a dud as there has been no follow-up to the initial report issued by the Security Department of CTA. But the many prosperous-looking Chinese tourists, pilgrims and of course “intellectuals” who seem to have open access to the Dalai Lama, and take up much of his time these days, appear to enjoy full security clearance. In fact I am told that that many exile religious organizations regard them as valuable patrons or jindaks. His Holiness seems convinced that through such outreach tête-à-têtes with Chinese visitors he is somehow influencing China’s perspective on himself, and invariably gaining its trust and sympathy. Unfortunately, he has been able to get very few of these people to come out openly and declare their support for his Middle Way program. This outreach effort is not confined to His Holiness meeting Chinese visitors, but has been institutionalized within the CTA with its own cadre of Chinese speaking officials appointed to what might be called “outreach” desks in New York, Switzerland, Taiwan and elsewhere, who organize symposiums, parties and social gatherings with whatever Chinese they can lay their hand on. This program has His Holiness’s full support and appears to enjoy considerable resources, unavailable to other Tibetan offices. 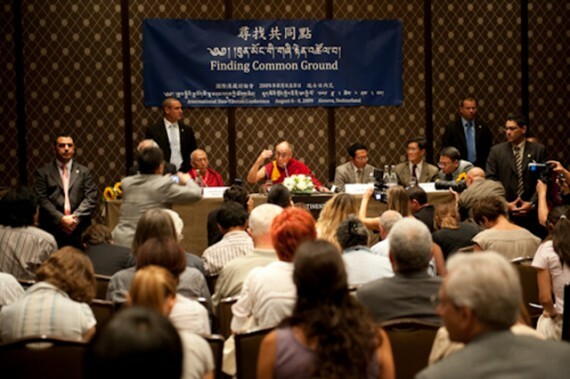 One of the more important “outreach” events organized so far has been a Sino-Tibetan conference ‘Finding Common Ground’, held in Geneva from 6−8 August 2009. According to the organizers it was “attended by over 100 Chinese and Tibetan scholars, educators, writers and human rights advocates”. Around twenty Chinese, all expenses paid by CTA, participated in this symposium, among them being Yan Jiaqi, a U.S. based social scientist who had served as a senior adviser to Zhao Ziyang, the ousted prime-minister of China who passed away in 2005. His Holiness also spoke to the conference. In the “Final Document” that came from this conference there was NO endorsement for the Middle Way Approach. Instead a kind of compromise expression of “respect” for MWA was included. Five other core resolutions passed by the conference on “Resolving the Tibet Issue” offer such well meaning but anodyne suggestions and observations as “respecting the fundamental human rights of the Tibetan people”, and “the resolution of the Tibetan issue is closely related to the democratization of China.” It also called on the Chinese people to reflect critically on “Han Chauvinism” (a term coined by Mao in 1956 describing Chinese superiority complex), and stated that “The Chinese government must comply with the principle of the rule of law.” The last and most feeble of these resolution stated that the Dalai Lama’s right to return to his homeland “must be respected”. The last resolution generated some discussion, about the Dalai Lama visiting Wutai-shan (riwo-tsenga), as a first step. “His wish to go on a pilgrimage to Wutai Shan is his right.” But one participant pointed out that “the authorities fear even a visit by the Dalai Lama will unleash strong latent forces” hence no permission would be given for even “…a simple pilgrimage to Wutai-shan”. I think the conference must have closed on this subconscious awareness of the inflexible reality of PRC’s refusal to negotiate with the Dalai Lama and even less the exile administration. Period. The exile administration, including the prime-minister Sikyong Lobsang Sangay, has made the Dalai Lama’s “outreach to China” a strategic policy of his own administration. In his Phayul article of 2008 the Sikyong goes into detail as to why such a strategy was vital for resolving the Tibet issue. He provides the example of Mahatma Gandhi, who Sikyong claims cultivated friendships with “British people from all walks of life” to obtain support for his cause. Of course, Sikyong is wrong here on two counts. First of all the friendships Gandhi made with nearly all white people in England, Africa and India, were genuine personal relationships based on a variety of shared interests, activities and beliefs, and not premised on “cultivating” them purely for political support. Secondly the English and others who rallied to support Gandhi, notably Madeleine Slade (Mirabehn) whom Sikyong mentions, and the Rev. C.F. Andrews (Deenabandhu), were committed to the Indian freedom struggle for independence from Britain. Gandhi didn’t have to compromise with them on his goal of independence, as we Tibetans have done by progressively watering down our original goal of independence to the Middle Way, then to the Sikyong’s “Partial-Middleway” (giving up democracy and even accepting Communist rule) and then finally to just “showing respect” for the MWA, as was resolved at the Geneva conference. There were other British promoters of Indian independence notably Horace Alexander and Wilfred Wellocks who formed the Council for Indian Freedom (C.I.F) and brought together Quakers, Pacifists, and members of the Independent Labor Party together to champion the Indian cause. The British supporters of Gandhi I find most appealing are the textile-workers of Greenfield Mill in Lancashire who lost their jobs because of Gandhi’s Swadeshi movement boycotting English textiles. 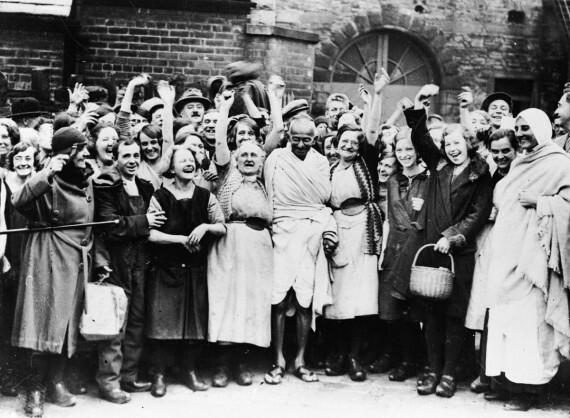 There is a famous photograph of Gandhi visiting the mill in 1931 and, instead of the trouble that had been expected, receiving a warm and rousing welcome from these unemployed workers. Our “outreach”, if we are to have one, should not be to self-serving and self-styled Chinese “intellectuals” (in the hope of gaining access to the rich and powerful in Beijing) but to the actual people of China, suffering under Communist rule and yearning for democracy and freedom. The Dalai Lama should be a spokesperson for our real “brothers and sisters” in China — the dispossessed and the oppressed: dying by the tens of thousands in “cancer villages”, slaving in Laogai Labor camps, and being turfed out of their homes and farmlands for development projects to enrich the oligarchs and Communist bosses. He might also speak out for Chinese Catholics, Protestants, Muslims, Buddhists and Falun Gong practitioners deprived of their right to worship and unrelentingly and cruelly persecuted by China’s Communist government.